Tarpon Springs, Fla., January 14, 2019 —Leepa-Rattner Museum of Art (LRMA), St. Petersburg College, Tarpon Springs, will host the Miniature Art Society of Florida’s (MASF) 44th Annual International Miniature Art Exhibition from Sunday, January 20th through Sunday, February 10th. Since 1976 MASF has supported young students with artistic talent by providing annual scholarships to high school seniors pursuing studies in Fine Arts. With its deep commitment to students and art education, LRMA is an ideal venue for some of these MASF students to showcase their own works of miniature art. To complement the 44th Annual International Miniature Art Show LRMA will display Rocky Bridges: Small but Mighty. This exhibition will showcase small-scale, mixed-media words and wearable art pins from the museum’s collection by Tarpon Springs artist Rocky Bridges. Special exhibitions on view at LRMA on January 20th include Weird Science: Technology and Art, Rocky Bridges: Small but Mighty; Rattner and Surrealism; Elemental: Fine Crafts from the Collection and Made in Florida: The Art of Giving. 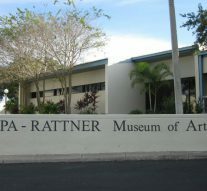 Opened to the public in 2002, LRMA is a modern and contemporary art museum with a collection of more than 6,000 works of 20th and 21st century art. The nucleus of the museum’s permanent collection includes works by Abraham Rattner, a renowned figurative expressionist; Esther Gentle, Rattner’s second wife and a printmaker, sculptor and painter; and Allen Leepa, Rattner’s step-son and an abstract expressionist artist; and an extensive collection of works by notable 20th century artists such as Pablo Picasso, Marc Chagall, Fernand Léger and Henry Moore. The museum is accredited by the American Alliance of Museums, a distinction held by only 6 percent of all U.S. museums. LRMA is located just west of U.S. Highway 19 at 600 E. Klosterman Road, on the Tarpon Springs Campus of St. Petersburg College. Tuesday, Wednesday, Thursday and Saturday: 10 a.m. – 5 p.m. 10 a.m. – 5 p.m.
Sunday 1 p.m. – 5 p.m. on Sunday. $7 for adults, $6 for seniors and free to children, students and active military with ID. On Sundays, docent tours are offered at 2 p.m. (included with admission fee). For more information, contact Beth Chernes or visit leeparattner.org.